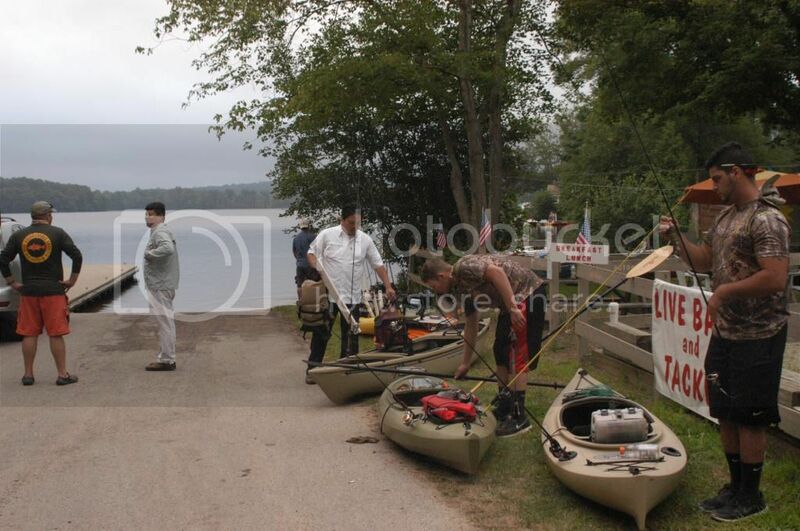 CTFishTalk.com: Moodus Kayak/Canoe Fishing Tourney July 27 - Connecticut Fishing Tournaments ( CT Fishing Tournaments ) - A Community Built for Connecticut Fisherman. Regretfully we will not be there. Family commits cold not be bounced out of Sunday. Will try to catch the next one. Have fun and please post pics after the event. I received a pm that Tureki-1 is going to the tourney. Have fun everyone! Any reports? I was thinking about you all this morning on my drive back from New Jersey....on the Merit daydreaming about flipping a jig.....hooking one on a senko...Hope all had fun. It looked like morning storms rolled through. Was there a late start? I think everyone is too worn out from the tourney to reply, RD54. I just woke up after sleeping since getting home. No problems at all with the weather. 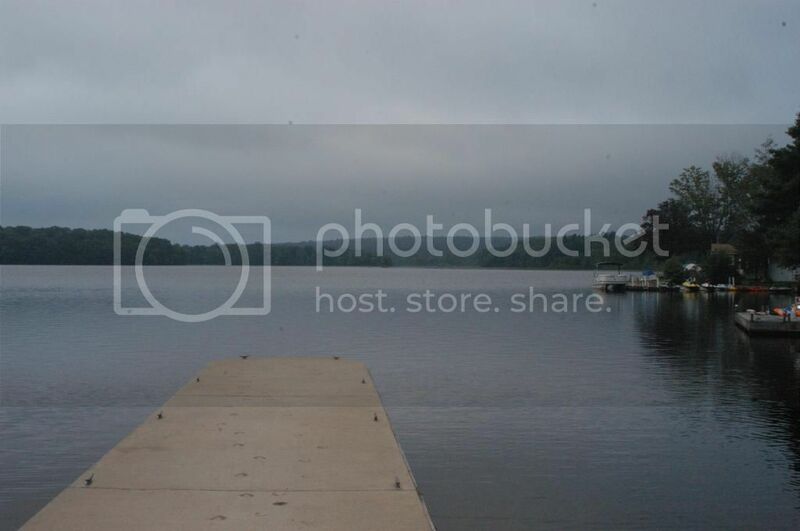 I never heard any thunder, and there were only a couple of short bouts of misty sprinkles. There were also some periods of gusty wind, although that never bothered me at all. 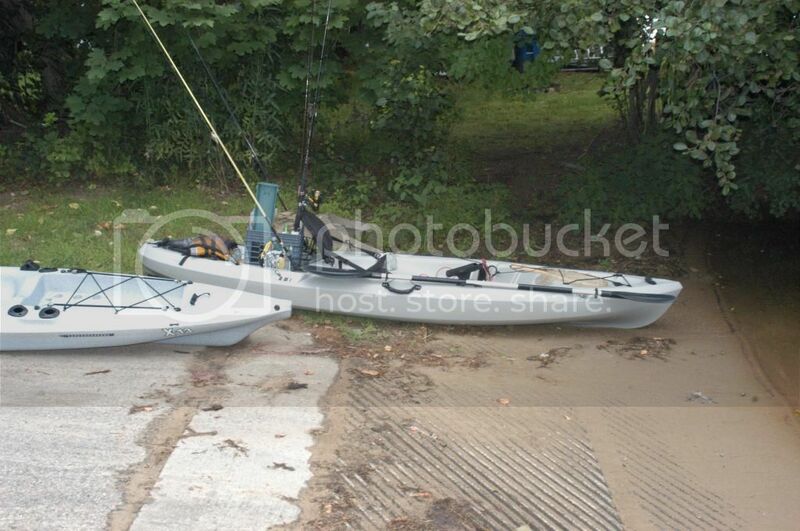 I guess that's one point in favor of a sit-inside kayak. The bite was weird. The fish were most definitely NOT actively feeding, especially in the morning. Those who stuck with spinnerbaits and other fast-moving lures had trouble finding fish. At around noon, though, those who were throwing frogs over the weeds, pads and grass started to see some hits. I decided to stick with only two lures; a wacky-rigged five-inch Senko and a Zoom Horny Toad. After 30 minutes, I pretty much put the Horny Toad away during the morning. I got hits on the wacky Senko only tight to the shore or tight to one of the few laydowns, and only when fished really, really slowly. Strangely, I didn't get a single nibble off of any man-made structures like docks or swim platforms. 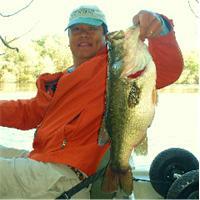 The largemouth bass wouldn't hit the Senkos; they'd gently pick them up off of the bottom. Around noon, I finally got a hit on the Horny Toad after I threw it up onto the shore and dragged it through some grass. The bass hit it when it reached the front edge of the grass, where the lily pads began. After that first hit, I got two more in the next four casts. I ended up boating two of the three bass. After I had caught a limit of keepers, I tried throwing a small white twin-Colorado blade spinnerbait along the outside edges of the pads for a while, but never got a hit. I also tried throwing a hollow-bodied paddle foot Scum Frog over the pads when I ran low on Horny Toads, but that thing was hardly weedless; it was next to useless over anything other than open water. I never got a hit on it, either. I didn't see any fish other than largemouth bass all day. Weird, huh? I ended up catching 17 largemouth bass, from 5-3/4 to 14-1/4 inches long. 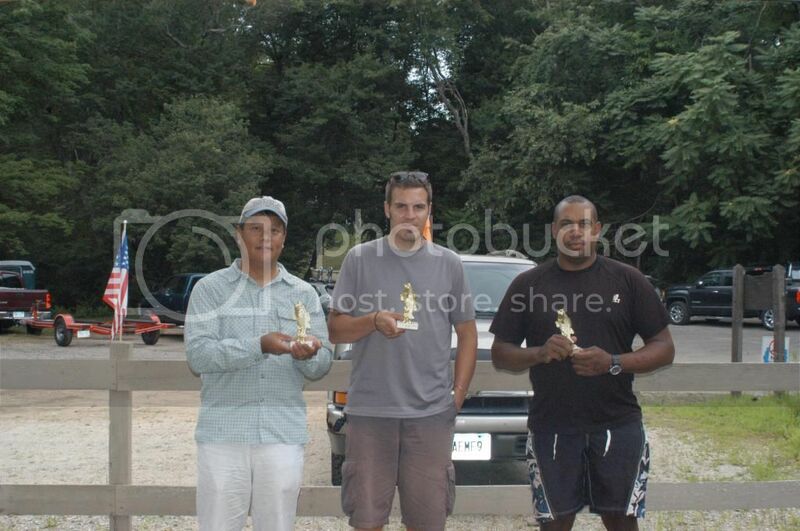 I took second place with 68-3/4 inches of largemouth bass. Anthony took first with 72, I think. And Alan (aka Mase2020) took third with 66+. Sorry about bumping you down the podium, Alan. Doug caught the 15-1/2 inch lunker. Yeap I said only 15-1/2! No offense, Doug! Once again, Alan threw another fun tourney. Thanks, Alan! Although some people were off of the water early, others wished we had more time to fish, perhaps another hour to make it a full eight hours on the water. Although Anthony edged me out for the first-place trophy, I'm thrilled to have a largemouth bass trophy to go with my first-place trout trophy from Alan's first kayak fishing tourney. Great recap of the day! Definitely a huge thanks to Alan for another fun tourney!! I landed 7 LMB total…and 11 Slime Darts! 3 of those Bass were on a Booyah Pad Crasher, 1 on a Zoom Horny Toad and 3 on a weightless Texas Rigged Senko. My fish ranged from 8" to 15". Doug took the Lunker Cash from me by a 1/2" tails length…for the 2nd tournament in a row! I'm not bitter about it or anything! 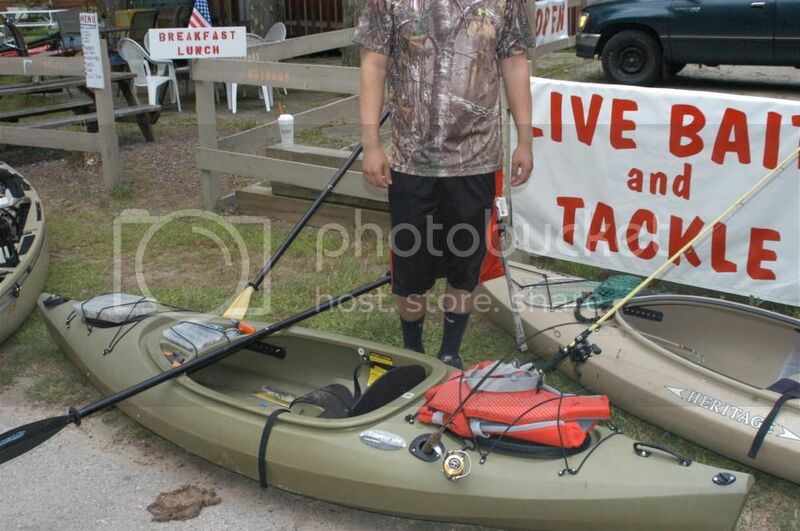 Looking forward to the next get together, be it a tournament or just a fun day of yak fishing with the group. Nice report Phil, glad you were catching fish. Congrats to everyone, sounds like a good day, maybe one of these days I'll be able to make one of these tourneys. Glad to hear you guys had no lightning. I was rooting for you to take this one Alan and I'm glad to see that you placed. See you guys at the next one. Another successful event, Thank Alan! Now, I really, really, want one of those shiny trophies! Excellent report. I'm glad the weather was good. It sounds like fun was had by all and the competition was pretty tight in some of those categories. Half an inch for the lunker is close! Hope to see more pics and of course many thanks to Alan for setting this up. I hope I can make the next one and participate in the fellowship and fun in person. 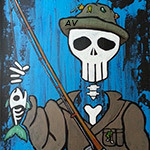 So all in all the tourney went off with out a hitch and I believe all had a good time. 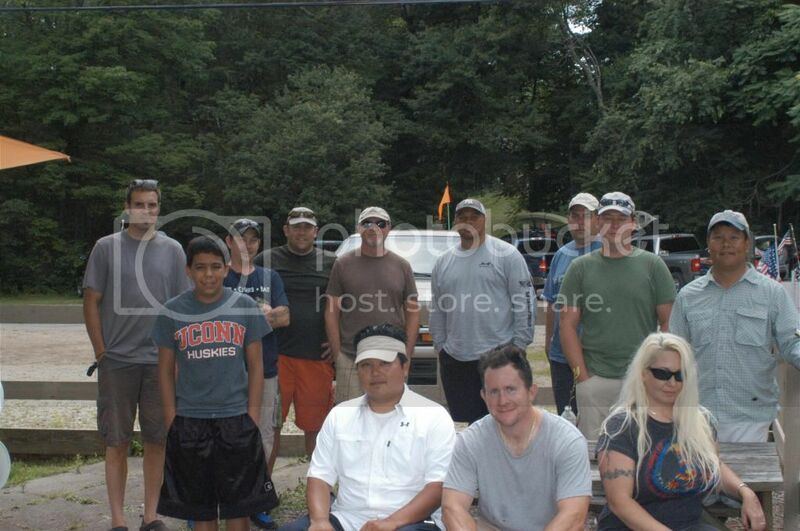 I want to thank everyone for coming out and we had a total of 17 anglers. A great bunch of guys, with some usual faces, Doug, Anthony, Kira and Jason and some new faces Pete, Jose, Rick and Jeff to name a few. Well my day started the night before loading my truck, but it was a lot easier not doing food. My 13 year old son opted to go this time so I had his stuff as well. Woke up at 4:00 AM to head down so I could unload. Found the launch area tight, but everyone did a great job compact parking behind each other. The wind was calm and the skies overcast , which was nice not to have the sun beating down on us. In all 82 bass were caught, 23 Pickerel, 1 perch and 1 crappie. Phil caught 18 fish, Doug G. caught the lunker at 15.5 " with Anthony a 1/2 inch behind. All in all it was a great day. We also talked about some ideas and changes for the next one. Some people left early before the picture, but we still took one. Congrats to Alan for a great tourney and congrats to all that placed. 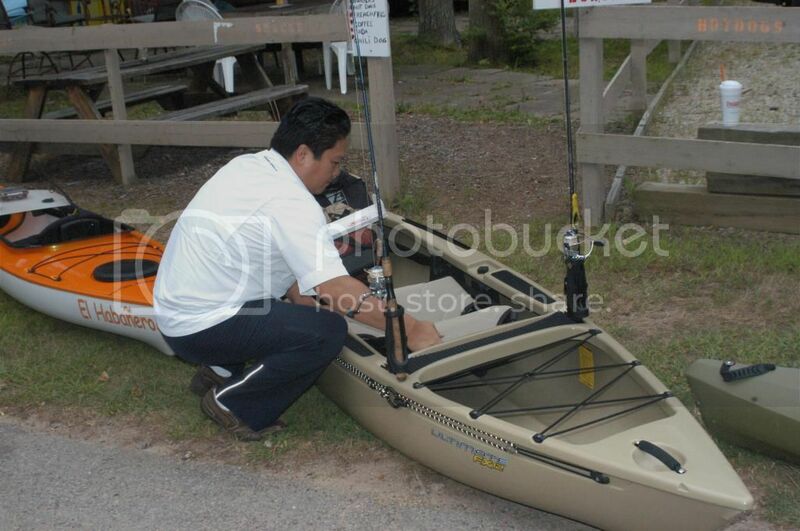 Reading these posts makes me want to go out and buy a nucanoe. WoW.. A Turtle Kiss sighting! And in the daylight, no less. I half expected her to burst into flames like a vampire in a John Carpenter movie.